Clear stress, uplift your mental outlook, and improve agility with three easy Feldenkrais® practices in nature. The deer have so much to inspire us in our current situation: they move silently with grace and efficiency through all kinds of terrain. They are alert and can quickly ground themselves and return to ease after a traumatic event. Learning from deer can expand our human awareness to utilize our senses to harmonize with the elements of nature. 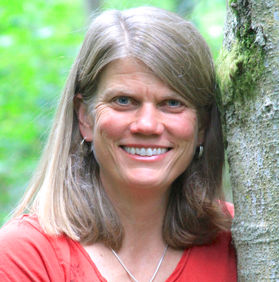 Annie Thoe, GCFP, is an Assistant Trainer in the Feldenkrais Method® in Seattle. She has over 33 years experience in private practice in bodywork, teaching mind-body education, nature retreats and advanced Feldenkrais workshops. She incorporates the elements of nature, animals, birds, fish, trees and rocks in her lessons to assist people in healing, movement and vitality. She is an Anake graduate from the Wilderness Awareness School’s premier naturalist, tracking and survival program. She also served on the Wilderness Awareness School’s Board of Directors for eight years. In addition to her naturalist and bodywork background, she has extensive study in martial arts, meditation, Aruyvedic medicine, writing and music. Prior to her Feldenkrais career, she taught clinical massage and kinesiology with a specialty in injury recovery and has a BA in Philosophy with highest honors from Macalester College. She has published extensive Feldenkrais audio programs with 39 lessons for Balance, Breathing, Head & Neck, Lower Back, Shoulders, and Vision and over 50 self-help lessons on Youtube channel: Sensing Vitality. She writes a newsletter with nature stories and vitality lessons available through her website: www.sensingvitality.com. In preparation for the summit talk and lessons, here’s Annie’s new article on “Move like the Deer”. Follow her on YouTube: http://www.youtube.com/c/SensingVitality.